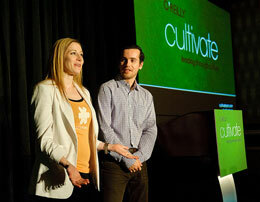 The Cultivate Conference 2013: Complete Video Compilation is now available. Cultivate was a one-day event for leaders (and aspiring leaders) at technology companies to hear directly from successful tech founders and managers, learn from each other, and come away inspired to build companies that make a difference. I find that improving the culture of the place where I work to be the most challenging, selfless, and rewarding work that I do. Great Speakers: Patrick Collison, Stripe; Kate Matsudaira, popforms; Hiten Shah, CrazyEgg / KISSmetrics; Patty McCord; and more. Great Topics: Crafting the right technology strategy for your company, growing an exceptional team, managing 1-on-1, creating processes that work—everything (well, the essential things) that technical leaders need to know about people, business, and tech. Great Advice: Straight talk about what works and what doesn't—from people who've learned to lead on the job, while growing a company. Great Connections: It doesn't have to be lonely at the top. Meet, collaborate, and share stories and strategies with others who are leading teams and companies. The very first O'Reilly Cultivate took place Monday, October 14 at the Hilton New York, and was co-located with Velocity, the O’Reilly web performance and operations conference.